The famous Breton merchant-explorer Captain Margaux hasn't been seen since her ship the Golden Spriggan sailed off over the horizon into the Sea of Pearls—which makes her house near the docks in Daggerfall available for you! Captain Margaux's Place is a small player house in Daggerfall. The house has one large room with a fire place and no courtyard. To purchase this house with Gold, you need to complete the Wyrd Friend achievement and Room to Spare. 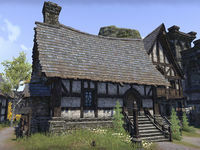 This house replaced Cergend House in Update 12.